This information sheet tells you what to do in an emergency. Please keep it somewhere visible in your household. Shaugh Prior Parish Council has a plan to enable the community to respond and deal with a major emergency when outside assistance is unavailable, or delayed.The Shaugh Prior Parish Council Emergency Team will activate the plan. The Emergency Team will endeavour to maintain contact with the Emergency Services and South Hams District Council.The Parish Council is concerned with providing shelter, food, warmth and general first aid for people who are vulnerable or made homeless during an emergency. MAJOR EMERGENCIES ARE CO-ORDINATED BY THE POLICE. FIRST TRY TO CALL 999 OR MOBILE 112. Local TV or radio will provide up to date information. Try BBC1 and BBC Radio Devon FM 103.4 MW855 The internet may also provide information. We have now delivered the Questionnaires throughout the Parish after weeks of careful planning!! We are on the home run!! We will inform you of further progress very soon. 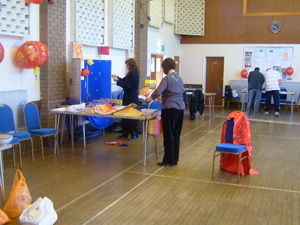 After the great success of our Chinese New Year themed Community Day we have already learnt a lot about our Parish. For instance did you know that the number of houses within our Parish has increased from 350 in 1999 to nearer 400 today? Over 200 people attended on February 9th and thoroughly enjoyed the fun! During the day we gathered a huge number of comments and are in the process of generating a questionnaire tailored to suit the needs and wants of our Parish. Already things are happening – several people were surprised at the number of young people (over 70 came to the fun day) who live within our Parish and as a result plans to restart a youth club are afoot! It has also become apparent that people are not aware of the services available to them such as the mobile fish, meat and general sundry vans that visit the parish weekly, or that there are still milk deliveries to the area as well as small groups that operate paper collections. We are now in the process of making this information available through the Parish Magazine and Parish Website. A lot of work is going on behind the scenes to ensure that the Parish Plan meets its one-year target and so far, we are sticking to it! The Parish Plan isn’t just about the things you want to change but also the things you value and wish to remain the same, the things that give you a ‘sense of place’, of belonging in your rural community. Future challenges resulting from the changes in operation of Imerys and Wolf minerals may mean we need to have a strong community voice to be heard! So make sure you complete your questionnaire as it will be arriving in the very near future. It is really important that your household completes it to really move our…YOUR…Parish Plan forward. In 1999 75% of households completed their questionnaire let’s beat that total! What a success!! Our Community Events Day was a huge success with over 200 people attending! Several constructive comments were given and we now have an excellent foundation for generating a questionnaire tailored to the needs of our Parish. It was a memorable day and a lot of fun was had by all. Many thanks to those who helped and donated memorabilia. For general info about the Parish Plan please scroll to the end of this page. Slow Traffic down coming into the Lee Moor Village Especially Football teams, Imrys traffic and Irresponsible residents. There is already a weight restriction on lorries passing through the village and over Shaugh bridge, this is ignored totally. What is the point of restrictions if the Police do not enforce them. A more active police enforcement and presence in the village is required. Better lighting up by Beatland Corner cross roads . We need pavements through the village of Shaugh Prior, traffic calming i.e. reduce speed limit to 20mph, introduce speed bumps or chicanes. Newspaper delivery Wotter/Shaugh Prior/Lee Moor? Renew the gate leading to Doctor’s surgery. See to door to Post Office to make it easier to open! THIS IS THE BEST PLACE IN THE WORLD!!!!!!! We like the village & rural life. No housing estates! I don’t want any more sheep, trees or fields!! When we moved to Dartmoor Cottages there was parking available between each of the blocks of terraces, 4 or 5 cars could park here. Now Imerys has sold off that land to the owners of the end terraced houses only – so where does everyone else park? A Parish Plan can help to give our community a voice. It can help us protect what we feel is important in our area and it can help secure funding to further improve our community. It is vital that everyone tries to contribute to it so that we produce a useful, accurate representation of the needs of EVERYONE in our Parish. We are have been actively consulting members of the Parish over the last few months which culminated in our Community Day - this was a great success and just shows the sort of thing that can be achieved within a small community. We are now facing the challenge of developing a questionnaire that will produce both qualatative and quantative data to serve us in our quest of improving our Parish. This will be achieved through careful analysis of the comments we have had so far along with professional guidence. Once developed, we will pilot them briefly before rolling out to all members of the Parish – FILLING in YOUR questionnaire will be paramount in enabling the Parish Plan to reach effective fruition. Please revisit this website regularly as we will be updating it and adding developments as they occur. We will hopefully be having more enjoyable events in the not too distant future – so keep informed again by checking this website and the Parish News.